April 9, 2018 -- A CT angiography (CTA) study has revealed that eating a Carolina Reaper -- the world's hottest chili pepper -- may cause some debilitating medical symptoms, according to a case report published online in BMJ Case Reports on 10 April. After ingesting a Carolina Reaper, a 34-year-old man with no significant medical history immediately began dry heaving. He then developed severe neck pain and excruciatingly painful headaches over the next several days that lasted just a few seconds, according to the authors from Bassett Medical Center in Cooperstown, New York, and the Henry Ford Health System in Detroit, Michigan, U.S. The severity of the symptoms led him to visit the emergency room. 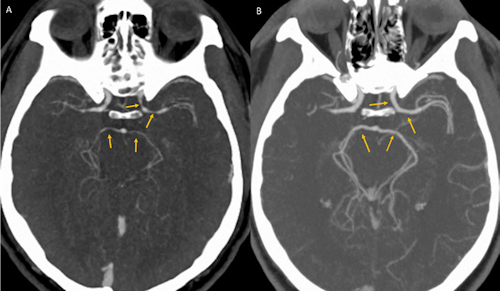 While a urine drug screen and noncontrast head and neck CT scan yielded unremarkable results, CTA (figure A) showed an unexpected multifocal luminal narrowing in the left supraclinoid internal carotid artery, the M1 segment of bilateral middle cerebral arteries, and P1 segments of bilateral posterior cerebral arteries consistent with vasospasm, according to the authors. A: CT angiography showing unexpected luminal narrowing in the left supraclinoid internal carotid artery, M1 segment of bilateral middle cerebral arteries, and P1 segments of bilateral posterior cerebral arteries consistent with vasospasm. B: CT angiography showing resolution of luminal narrowing after five weeks of supportive care. Images courtesy of BMJ Case Reports 2018. "A presumptive diagnosis of thunderclap headache secondary to reversible cerebral vasoconstriction syndrome (RCVS) was made based on the clinical presentation of a severe acute headache, exclusion of aneurysmal subarachnoid hemorrhage, and segmental cerebral arterial vasoconstriction on CT angiography," wrote the authors, led by Dr. Satish Kumar Boddhula of Bassett Medical Center. While this is the first case of this syndrome that has been reported from chili peppers or cayenne, the authors noted that ingestion of cayenne pepper has been associated with coronary vasospasm and acute myocardial infarction. The patient's symptoms improved with supportive care. He had no further thunderclap headaches, and repeat CTA (figure B) performed five weeks later showed that the luminal narrowing consistent with the syndrome had resolved, according to the authors. The full case report can be found on the BMJ Case Reports website.